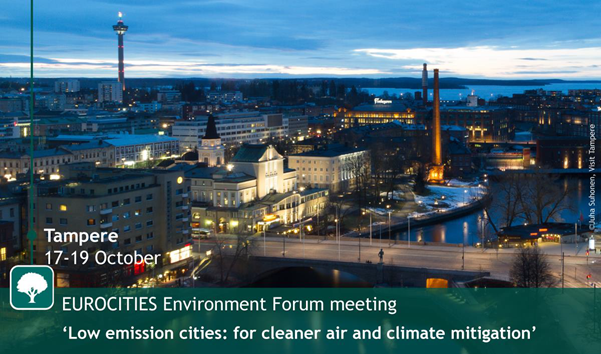 The ICARUS project will be present at the EUROCITIES Environment Forum meeting: Low emission cities for cleaner air and climate mitigation that will take place on 17–19 October 2018 in Tampere (Finland). Dr. Alberto Gotti, ICARUS Project Manager will chair the roundtable “Win-win solutions for air pollution exposure management in cities”. The roundtable will present the H2020 ICARUS project focusing on urban impact assessment in support of air quality and climate change governance in the EU. Some results obtained on the co-benefits to urban air quality and public health from the introduction of greenhouse gas (GHG) emission reduction policies in the city of Thessaloniki, will then be presented, together with a number of traffic related policies analysed, including the introduction of underground rail in the city centre and changes in transportation modes. Traffic pollution has been assessed for the baseline scenario in year 2010 and two future scenarios in year 2020, a business-as-usual (BAU) and a GHG emission reduction scenario (CO2 scenario). Concentrations of PM10, PM2.5, NO2, CO and benzene were used as input to advanced population exposure models from which we estimated impacts on human health using well-established exposure-response functions.